In keeping with their holiday tradition, Estée Lauder has unveiled over 30 new limited-edition solid perfume and powder compacts that will be sure to leave any Estee fan in a tizzy. 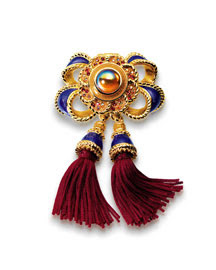 Each majorly-covetable piece includes moving parts, high attention to detail and vibrant colors. Many of them include Swarovski crystals and other gorgeous stones. Renowned designer, Jay Strongwater, has even created six to die for designs boasting his magnificent enamel and stone work. The limited-edition Beautiful Lollipop Twist Solid Perfume Compact ($85 upper left)). Too cute in it's design and even more darling with what it houses inside. The phenom Beautiful perfume in solid form. It totally speaks to our inner child. The exclusive White Linen Passementerie Bow by Jay Strongwater ($325) falls on the other end of the spectrum price-wise. A more elaborate piece it contains beautiful enamel work by Strongwater, divine stones, and pretty silk tassels. Inside you'll find the classic White Linen in perfume solid. It's definitely a really big splurge, but it will make a perfect gift for any collector of compacts...come on, there's one if every family...or someone who's just a fanatic White Linen lover. Both should be available at any Estee Lauder counter...although we found these on esteelauder.com and bergdorfgoodman.com respectfully.